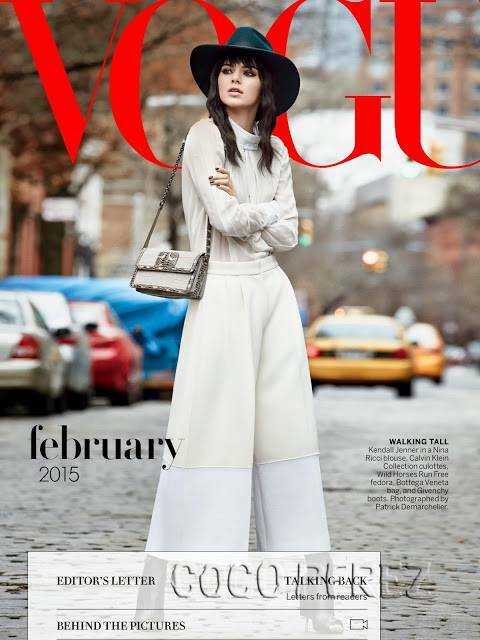 Kendall Jenner is already well on the way to becoming the supermodel of 2015, love her or hate her …. At only 19 Kendall Jenner is well on her way to becoming a supermodel, this despite her detractors who have come to wonder how a reality starlet under the Kardashian umbrella has come to curry such favor, gigs (her roterie is impressive) and now the GQ’s most voted coolest woman of the year status. While some may wonder how Kendall Jenner came to earn her mantle the reality probably is it’s been a long time coming as the teenager came to be thrust in our collective consciousness when she was just 14 when she was first introduced to us as the gawky pretty teen in the Kardashian show. Ironically it wouldn’t be until the reality starlet began to break away/distance herself from the show which preceded her fame that she would begin to land her impressive roster of campaigns, including recently being unveiled as the face of Estee Lauder. Not bad work if you can get it and Kendall can sure and will get it. Which is to say use the vehicle of a reality show to gain instant and mass exposure (and by proxy mass condemnation as the Kardashian family stoically have come to terms with as their every move is forever paraded on tabloid covers) and then cry foul and whimper that the public has got it all wrong and that you never aspired to be a reality star in the first place and that you’re willing to do anything to actually live your real dream: Kendall Jenner supermodel. Except Kendall Jenner doesn’t in reality like most models have to bother with what it really takes to become a supermodel. Her fame, constant exposure, family connections has afforded her an enviable head start in the world of fashion that takes most supermodels years before they even reach supermodel status. But then to be fair, Kendall Jenner has been in the game for at least 5 years, just not in the fashion world and that too might be the secret: get the exposure, ridicule, access, connections whatever it takes and then segue way over whilst the public cries foul. But why cry foul in the first place? Who ever said there had to be a correct way of going about things? Who ever said that success only comes to those who ‘rightfully toil’ for it (and Kendall and co have toiled for it albeit in non conventional ways and that too might be the secret and way to go these days? ), who paid their dues, worked for lesser designers, smaller magazines before eventually gracing the big covers (as Kendall already has) walked for the big designers (as Kendall has-she’s now Karl Lagerfeld’s newest Chanel muse). ‘When we are casting Marc Jacobs, I always try and throw in a couple of unexpected models. Intrigued because Kendall already had momentum under her belt given her Kardashian exposure, intrigued because big name designers were willing to work with the then untested rising protege, intrigued because in the heady and fickle world of fashion it always pays to use a name brand to jettison one’s own label and fortunes to and hope despite the criticism it may draw it will ultimately bring buyers to the fore. Reiterates Grand: ‘With an Estee Lauder contract under her belt, a multi-page editorial in US Vogue and work with the likes of Karl Lagerfeld, Katie Grand and Marc Jacobs, Kendall is the bonafide girl of the moment. Perhaps one of the reasons Kendall Jenner has risen so quickly to the fore is the fact that whilst many have criticized her for ‘unfairly’ head jumping the modeling queue is the reality that the model brings something to the table that most models don’t, looks aside: social media followers and lots of them. Notes the UK’s dailymail: It probably doesn’t hurt that the second youngest of the Kardashian clan has a cool 33 million Instagram followers – the equivalent of more than half the population of the UK. And whether you love her or loathe her ( a fact not lost on the Kardashian youngster like her older sisters) she has indeed worked hard to get where she is. You try amassing 33 million instagram followers. A feat that would make most social media directors at any well known label, agency, outlet envious and frothing giddily from the mouth and naturally more than happy to bring her followers over to their stable and by extension get those dollar signs ramping up. Which like it or not is really what being a supermodel is all about, not whether you necessarily have killer features (but not too fear, Kendall has enough in her plaintive beauty to get fashion editors booking her). She continued: ‘I would always be looking at these supermodels, they were just so amazing to me, they were like superheroes. And why not, with Forbes recently named Kendall as one of the top female model earners at $2.8 million, and already commanding close to a million dollars per endorsement Kendall Jenner is already well on the way to becoming the supermodel of 2015, love her or hate her …. Deserve? If only it were that simple, if only, as they say, things were that black and white. Unfortunately we all as a society now stand with one foot in what has been, and one foot is what has yet to be leaving our very souls yearning for the comforts of what we know, for what we are comfortable with, yet, at the same time, buried within each of our souls is a spark of desire for adventure, a mad wish to charge headlong into the unknown for to see not only what may be there, but what we are and can be as well. Real answer: No model deserves anything. You shouldn’t get money, attention, and adoration for being born with good genes. And this whole family should be shot into space…I’d watch that reality show.